Built for comfort and durability and packed with more features than any other system. Thick padding that won't retain water. New 2" waist buckle for 2017 made from Acetal. Made from high grade vinyl and doubled up where necessary. Rear bucket has a draw string closer and can be used for trees or personal effects. Small compartments are included for smaller items such as electronic devices, bug spray etc. Stock buckets are plenty big at 14" deep but for those who want them bigger, 15" and 18" deep buckets are also available. Standard configuration has 3 pouches, however, 4 pouch versions are also available. For more information on the above accessories click here. CUSTOMIZE IT! One side bucket or both can be changed to 15" or 18" deep buckets instead of the stock 14" deep buckets. Contact Bushpro directly for custom bags. Our 4 pouch bags have had a steady following for over 15 years. Widely used on the West Coast for multiple species planting or by those who simply want to carry more trees. 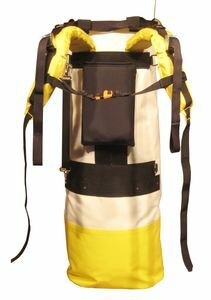 Uses the same highly adjustable harness as our 3 pouch bags. Rounded corners on the bags to reduce bag rub and reinforced bottom and lower sides for extra life. All the same great properties of our 3 bucket design with a large amount of hi-vis added that is visible if you are upright, from the side or if you are planting a tree. The stake bag combo is designed for planters who have to carry stakes, tubing or some other long object in their planting bags. The beauty of this system is that it can convert to a normal set of tree planting bags when you don’t need the large stake bucket and sleeve. Package includes a fully assembled Stake Bag and a replacement harness and rear bucket for conversion to traditional tree planting bags. A stake bag and harness system that will convert late-model Bushpro 3 bucket tree planting bags to a stake bag.